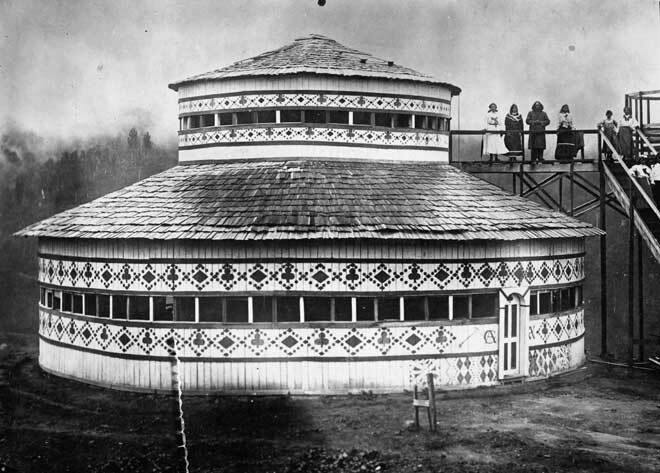 The magnificent circular temple at Maungapōhatu, in the depths of the Urewera forest, was the heart of the religious community formed by the Tūhoe prophet Rua Kēnana. He is seen on the high platform at right (third from left) with several of his wives. Named Hiona (Zion), the temple was built by Rua's followers in 1907 and painted with a playing-card design of yellow diamonds and blue clubs, which had religious symbolic meanings.